Many Americans may not be ready yet for transhumanist body implants, but a recent study at UC Berkeley promises that future may be one step closer regardless. Engineers at the university have designed a tiny, sensory transplant the size of a grain of sand, which was implanted successfully in the muscles and peripheral nerves of rats. 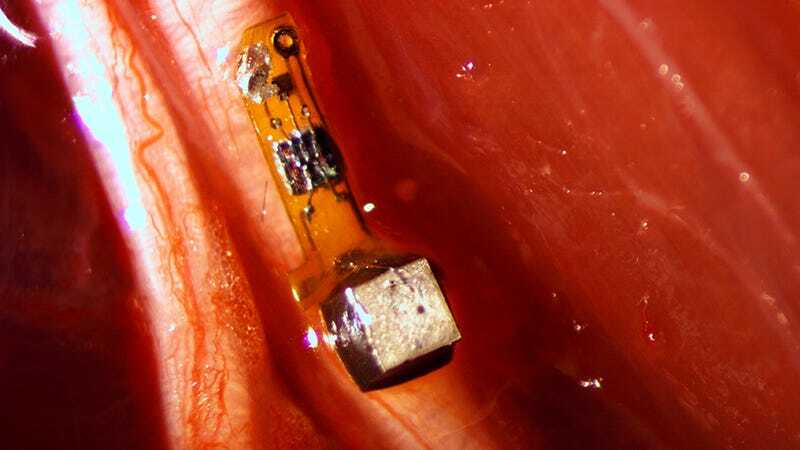 The “neural dust” allows users to monitor vitals in real time, and could open the door for similar implants that can help people neurologically monitor things such as prosthetics. The results were published in the latest issue of Neuron this week. According to researchers, the sensor—which is around 3 millimeters long—contains a piezoelectric crystal, which converts ultrasound vibrations into electricity, which then powers the transplant. The sensors were powered up every 100 microseconds with ultrasound pulses, which gave researchers real-time results. Ultrasound was utilized because it allows for the use of “very, very small implants.” Radio waves, in contrast, would’ve only been readable with high doses of radiation. “Having access to in-body telemetry has never been possible because there has been no way to put something supertiny superdeep. But now I can take a speck of nothing and park it next to a nerve or organ, your GI tract or a muscle, and read out the data,” said Michel Maharbiz, one of the lead authors on the study, said in a statement. Additionally, the sensor is coated with surgical-grade epoxy, and scientists hope that the next generation can last decades inside the body. “If a paraplegic wants to control a computer or a robotic arm, you would just implant this electrode in the brain and it would last essentially a lifetime,” said Ryan Neely, a neuroscience graduate student at UC Berkeley. In the future, researchers hope to shrink it even further. According to the Independent, they hope to get it to around 50 microns, which would allow it to be used in the brain.